Senator Kennedy envisioned an institute for civic education and public discourse focused on the U.S. Senate and the vital role it plays in our democracy. To fulfill that vision, the design team imagined a new model for a dynamic and participatory exhibit, event, and learning environment—and brought it to life. The new Edward M. Kennedy Institute for the United States Senate departs from the concept of a traditional museum in that it doesn't focus on preserving and presenting artifacts to tell a story fixed in time. Rather, the Institute embodies the Senator's idea for a new kind of cultural space, a place where people can participate in an inspiring, hands-on experience that deepens and expands their understanding of the Senate throughout history to the present day. As one of the most interactive museums in the nation, the Institute offers visitors unprecedented opportunities to engage with their fellow visitors—and the exhibits—while learning through 'play.' Through innovative, interactive technologies, as well as highly visual, information-rich digital media content and collaborative group activities, the design team created an unparalleled, immersive experience that directly engages visitors in the spirit of civic dialogue, compromise and collaboration. 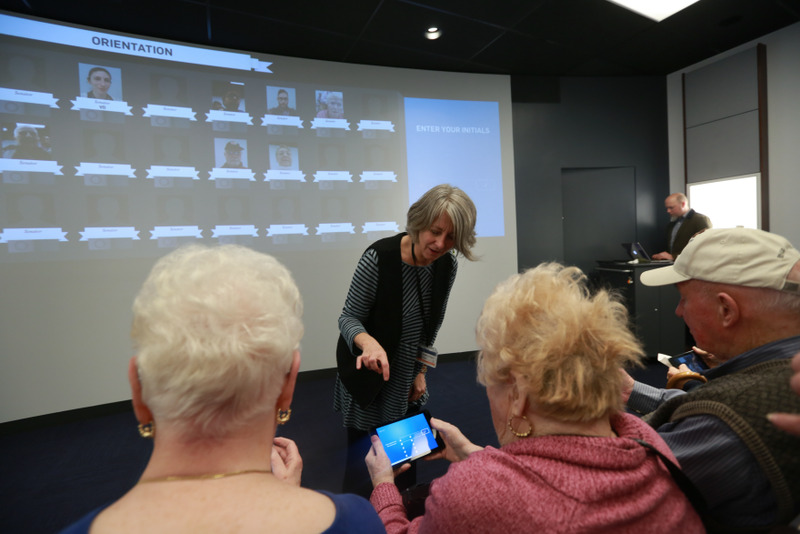 Simply put, visitors don't passively look at the Institute's exhibits, they become 'Senators-in-Training' for the day, using their tablets as a guiding 'Chief of Staff' as they experience a sequence of exhibits and engage with interactive media and other visitors. The last stop is an awe-inspiring full-scale replica of the Senate Chamber. There, up to 100 visitors actively debate and negotiate in 'Today's Vote,' or participate in the 'Senate-Immersion Module' (SIM), collaborative activities that combine the best of human interaction and innovative gaming-based technologies to build consensus. 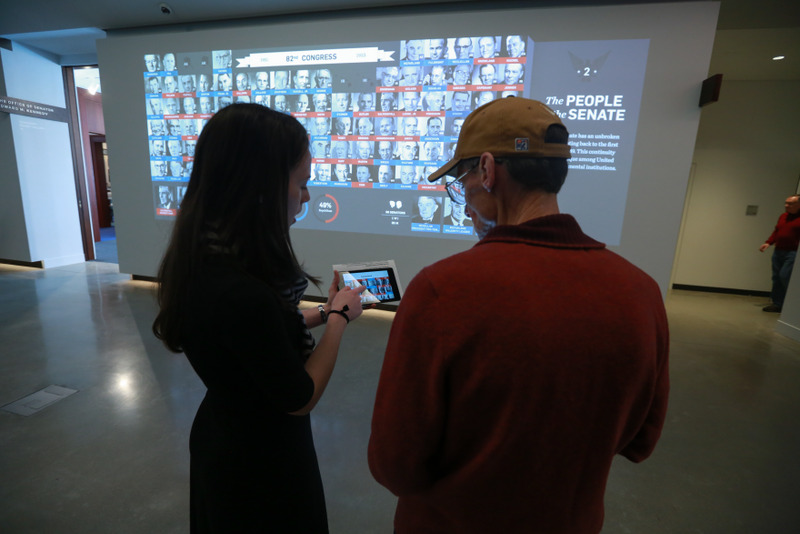 THE ORIENTATION THEATER:Visitors set up "Senator" profiles on tablets: They take a 'selfie,' choose a state and party affiliation and learn how to navigate the exhibits. 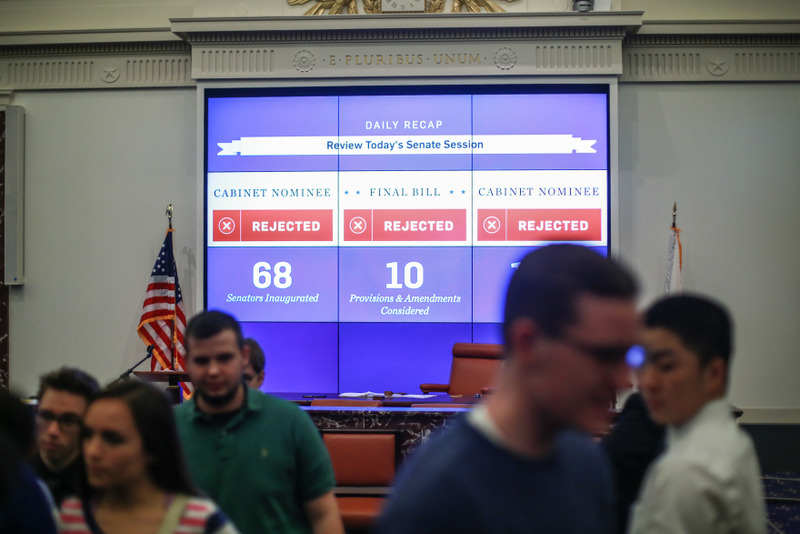 THE VISITOR EXPERIENCE:In the areas surrounding the Senator Chamber, visitors engage with a series of expansive digital media wall displays, using their tablets as research tools or as interactive devices to vote, learn how a bill becomes a law, or pledge support for a cause. SENATE IMMERSION MODULE (SIM):Drawing upon our background in the development of live-action and multi-player games, the team created the SIM, where each 'Senator-in-Training' debates and prepares for a vote on legislation facilitated by role-playing actors and interconnected technologies. 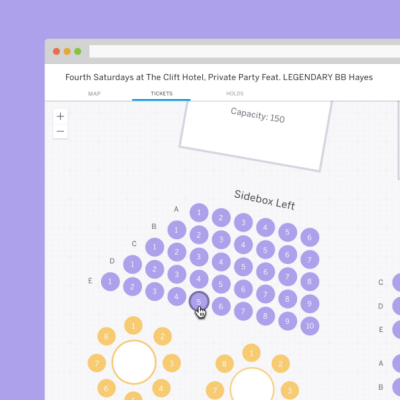 EVOLVING OPEN-SOURCE STYLE CONTENT PLATFORM:The team conceived of a new model for institutions to develop and update content that draws audiences into participatory experiences. Schools, institutions and organizations can create their own content for the Senate Immersion Module (SIM). The team's design for the Edward M. Kennedy Institute activates and deepens the visitor experience, and offers a new model for a dynamic, ever-evolving museum environment. In the Institute's first year, about 10,000 students visited from about 80 different high schools and colleges, including Harvard, MIT and the University of Mississippi. The Senate Immersion Module Drawing upon our background in the development of live-action and multi-player games ESI Design created the Senate Immersion Module (SIM). The Senate Immersion Module In a stunning, full-scale representation of the Senate Chamber, up to 100 visitors actively debate and negotiate in Today's Vote, or participate in the Senate-Immersion Module (SIM), collaborative activities that combine the best of human interaction and innovative gaming-based technologies to build consensus. The Senate Immersion Module In the SIM, Senators-in-Training debate and prepare for a vote on legislation facilitated by role-playing actors and interconnected technologies. 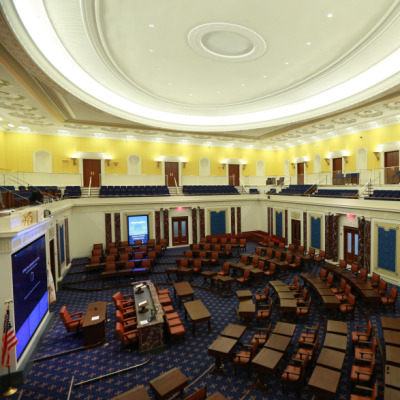 The Edward M. Kennedy Institute for the United States Senate is designed to bring the U.S. Senate to life — using technology and activity design to educate the public, invigorate public discourse, and inspire visitors to become more active in their own communities. The years-long planning and design process for the Institute cast a wide net. Along the way, Senate experts helped us, our partners and sub-consultants better understand the legislative process. Our Content Design team made use of a range of resources to deliver research reports about everything from the intricacies of the Senate to current trends in educational frameworks. Our Activity Designers developed game-like experiences for the Senate Immersion Module, and facilitated comprehensive 'paper prototype' playtests with over 2,000 players ranging from students and teachers to military officers and others. These playtests yielded rounds of feedback that enabled us to refine educational activities that were adaptable to school curriculums, along with content modules that educators could customize on their own and bring to the Institute to try out. The custom supporting software was developed with sub-consulting groups to make technological interactions seamless, invisible and fun. The design team also coordinated with a world-renowned architect to develop a building that could support the historically accurate replica Senate Chamber, educational programming and next-generation hardware. The Institute employs two primary forms of interaction: activity-based learning and interactive digital media. 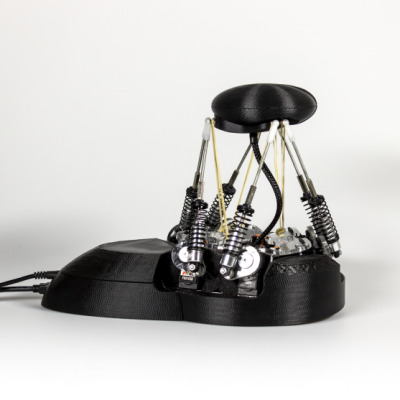 An open-source content platform and curriculum materials promote sustainability by allowing updates with almost no physical modifications, as the hardware and software can host a wide range of templates and content. The Institute experience is founded on flexible activity-based software. While it is designed for the general public, the experience can be tailored for young children, high school students, academics, and other groups who can access and develop its specialized content. In this way, the Institute is flexible enough to provide an engaging visit for all. Because the design team was responsible for an experience cohesive throughout many spaces, touch-points, activities and technologies, their process affected all aspects of the Institute's environment. The resulting design reflects this cohesive process: With its full-scale replica of the U.S. Senate Chamber and sweeping interactive exhibits, the Institute immerses visitors in the Senate process, providing them with a hands-on opportunity to collaborate, negotiate and compromise. 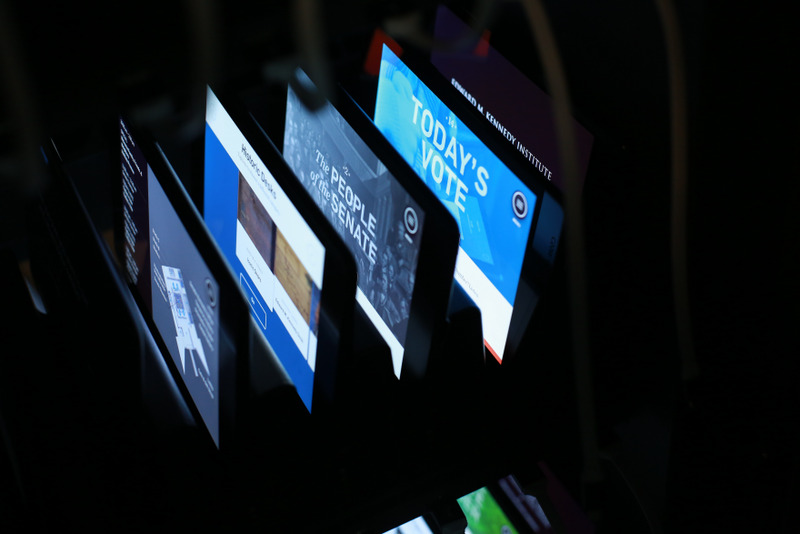 The visitor experience is powered by technology and media: A digital tablet given to every visitor acts as a guide and voting tool throughout their experience. Dynamic, interactive exhibits as expansive as 53-feet long are projected on the Institute's walls. Visitors use their tablets to interact with these exhibits. 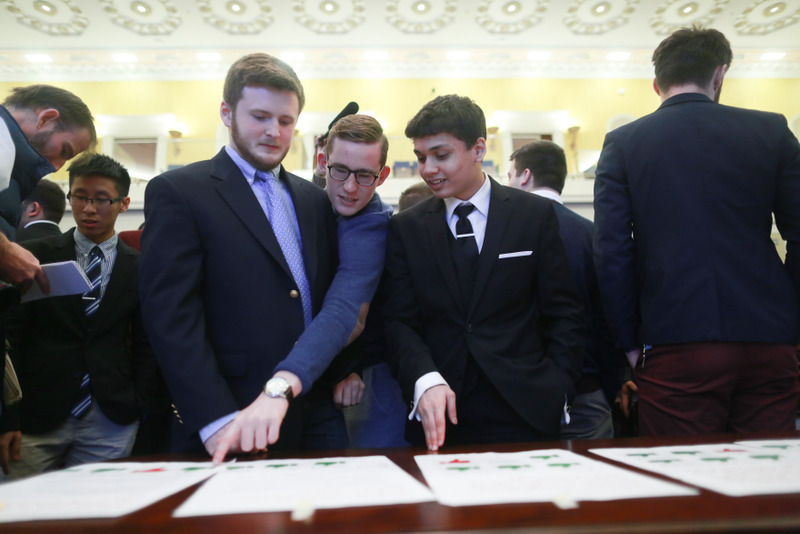 They create Senator-in-Training profiles; explore exhibit topics in greater depth; collaborate with other visitors to help a bill become a law; earn pins as they complete exhibits; and vote on contemporary issues. 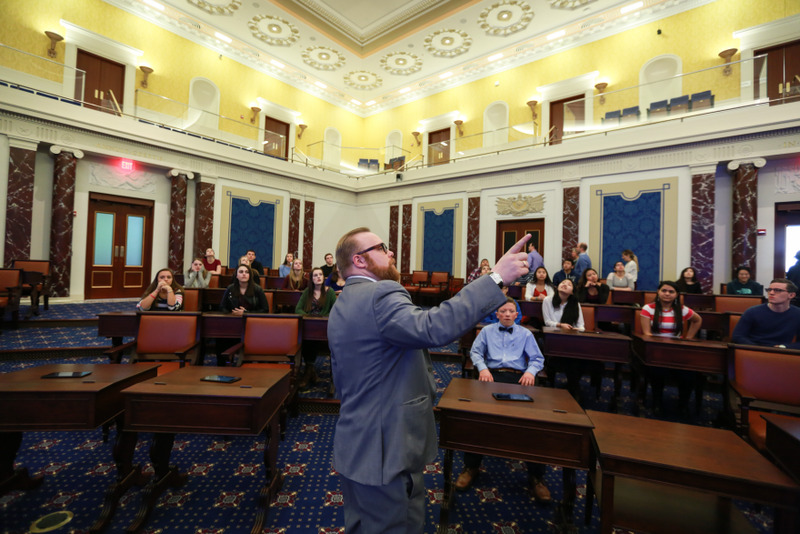 After visitors have explored the exhibits, they enter the Senate Immersion Module (SIM), an immersive educational experience in which students and groups of up to 100 participate in both historic and contemporary simulations of the U.S. Senate. The Module is a living platform for which organizations can create their own content based on any legislative issue. To date, 24 institutions—from the University of Louisiana to the Heritage Foundation—have created content for the Senate Immersion Module, which is now accessible for any group to use and experience. The result is an innovative 'open source' like museum experience. - Orientation Theater: Attendees begin their experience by receiving a tablet and watching a short video about the Senate and the Institute. Using their tablet, they personalize their own Senator-in-Training profile with information such as their party affiliation and home state. - What is the Senate? 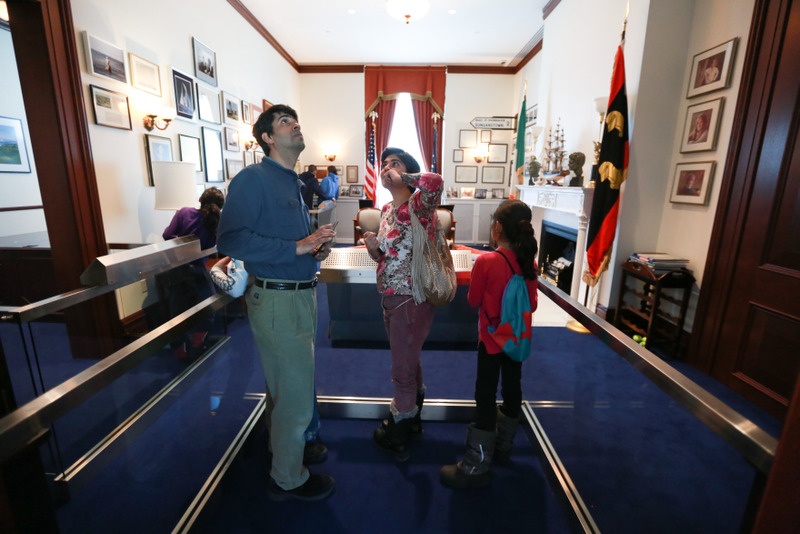 : An overview of the Senate's founding and role in the U.S. government. 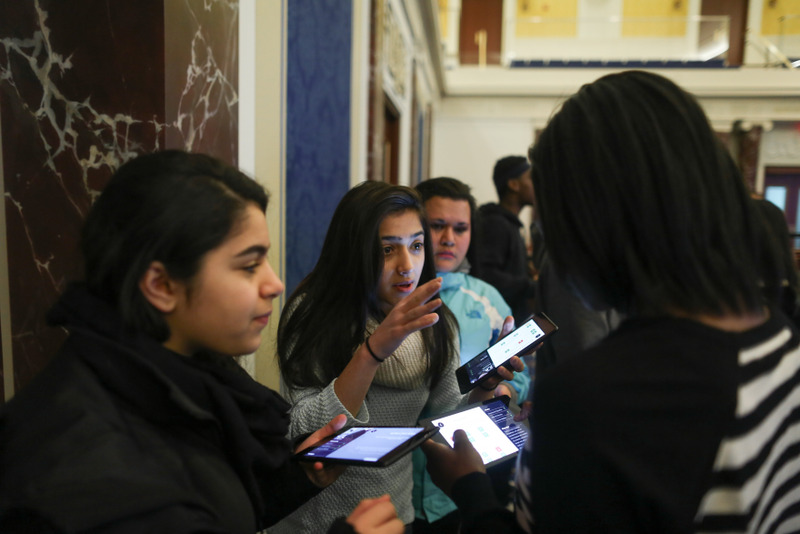 Visitors use their tablets to explore key Senate terms and definitions to help them better understand the Senate and get the most out of their visit to the Institute. - People of the Senate: An installation showcasing every current and former Senator. Visitors use their tablets to search Senators by name, session or state and look up biographical information. - Senate Milestones: A timeline that highlights legislation that defined the nation's evolving response to the 'Issue of the Day,' such as immigration or health care. Visitors use tablets to dive deeper into specific milestones or browse content about other major moments. - People Who Made a Difference: A display of people who impacted our nation. 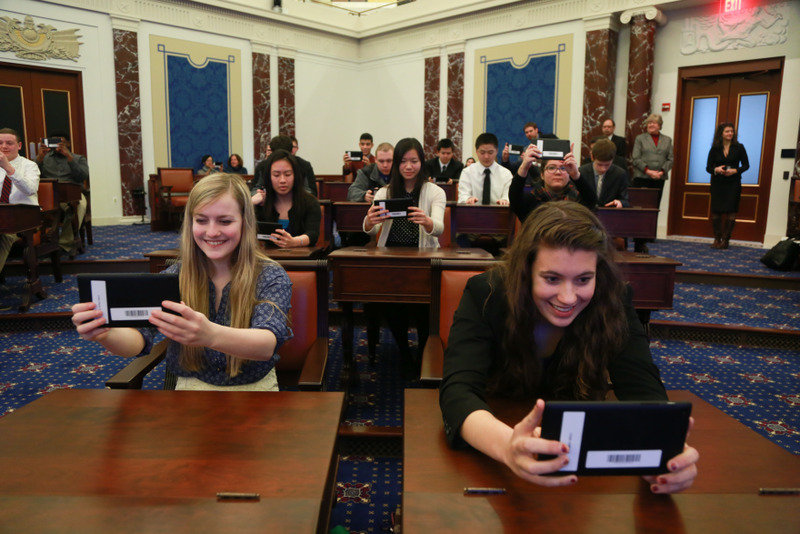 Tablets can be used to look up individuals for further insight on how they made a difference. - How a Bill Becomes a Law: A collaborative experience in which visitors join in a voting activity to pass a bill establishing the official toppings of the National Ice Cream Sundae. Visitors use tablets to vote on the toppings they wish to be added to the Sundae Bill. - Cloakroom Conversations: A small group activity in which 2–5 visitors join together to discuss the topic of the day, such as policies on immigration, agriculture, civil liberties and more. They work to choose provisions and craft a balanced bill that could garner support and votes in the Senate from both conservative and liberal interests. - Today's Vote: When a Today's Vote is held in the full-scale representation of the Senate chamber, visitors watch actors debate legislation currently pending in Washington—such as the Pay Workers a Living Wage Act—and then vote on legislation using their tablets. 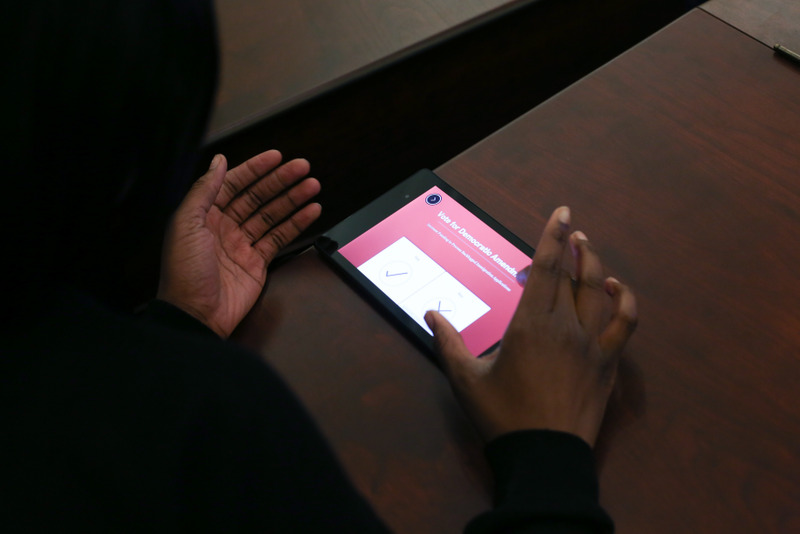 - Make a Difference: Visitors can use their tablets to pledge to make a difference and commit to an activity that contributes to the civic life of their community or nation. Their pledge is then shared on the Institute's interactive display wall. 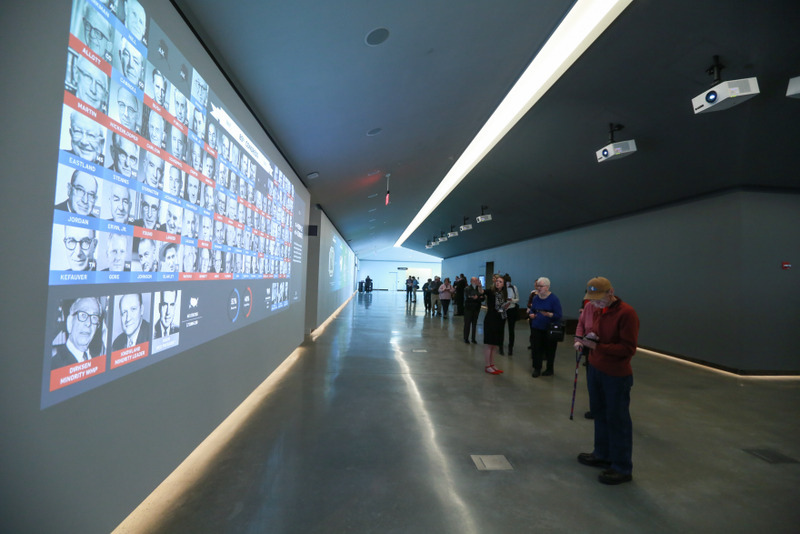 - Your Accomplishments: Before visitors conclude their experience at the EMK Institute, they can choose to post their achievements to a display wall, which lists the pins they earned from interacting with the exhibits. Visitors can also choose to email their pins home to themselves or share them with friends or family. In its first year, the Institute has enjoyed much success. Visitors have earned over 149,800 pins since the Institute opened in March 2014. In the Institute's first year, about 10,000 students visited from about 80 different high schools and colleges, including Harvard, MIT and the University of Mississippi. The 'How a Bill Becomes A Law' game has been played over 7,700 times, and over 18,200 visitors have participated in the Today's Vote program. The results of these experiences are best summed up through a final statistic: At then end of their experience, visitors at the Institute make pledges on topics ranging from participating in a voter registration drive, to attending a school committee meeting, to contacting their Member of Congress on a local issue. To date, more than 18,940 pledges have been made. 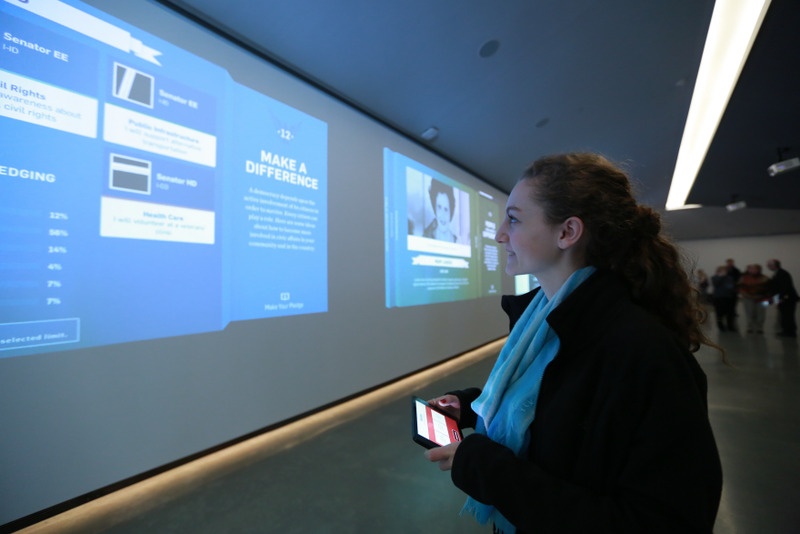 We really appreciated how the digital experiences in the Edward M. Kennedy Institute were designed to facilitate and support physical and social interactions with other visitors in the space. 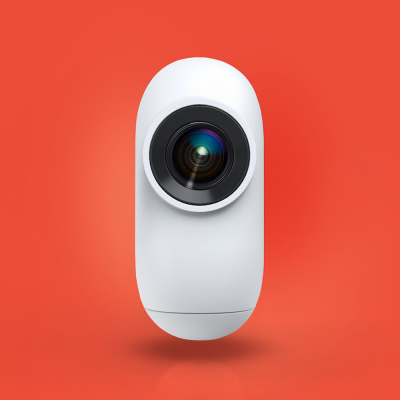 The design of the experience was well-tailored to the prospective audience and used technology in compelling, but not overbearing, ways.